Too often companies view sales channels as being binary — either they are in-house sales teams or value added resellers with the organization’s product as part of a larger portfolio. A growing number of the most successful sales organizations in the world have discovered that view to be narrow and are leveraging a third element to be better than their competition – sales outsourcing. 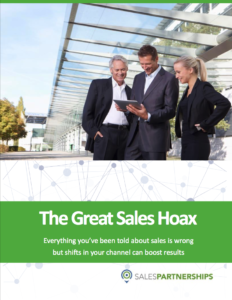 The newest research and trends surrounding sales growth. How big data is changing the way sales are made. The best ways to integrate outsourcing with your internal sales team. How to know if it’s the right time to invest in sales outsourcing. Common market stages that make sales outsourcing a profit engine. Sales Partnerships delivers results by constantly focusing on improving every element of selling. Our capabilities — the right people, understanding market and demographic data, and vast experience — make us the best collaborative partner for driving lasting results. This has helped us become the gold standard in external selling partners. Over our 20-year business history, we have perfected our unique and proprietary approach to ensuring every Sales Partnerships client receives a team that delivers an amazing branded experiences and measurable return on their investment, or ROI. The result is a turn-key sales and marketing outsourcing solution that helps your organization tackle all your challenges quickly and professionally.